Where did this eating machine come from? Big Guy went to sleep one night – at 8:30 no less – a fussy eater who griped about everything. He woke up next morning and started devouring the house with termite-like ferocity. Three bowls of Cheerios for breakfast – that always seems to be the food that starts the pig out. Salami – it’s really roasted turkey but please don’t tell him – cheese and strawberries for lunch. Turkey noodle soup for dinner – he picked out the carrots, but that’s OK because plenty of the evil vitamins had cooked into the broth. About an hour later, he had graham crackers and apples before going to bed and drifting off as soon as his head hit the pillow – again at 8:30. 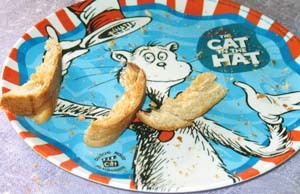 The next morning he forgot to complain about the crusts on the toast at breakfast, leaving only a few on the plate. I didn’t know there were Stepford Kids, too. Have brain transplants been perfected? Funny but I didn’t see any surgical scars. OK, so his vegetable intake still is nonexistent except for the spinach-spiked marinara. But at least he’s off the “begging for all candy, all the time” plan. Why? I have no idea. But I’m not complaining. Maybe he just got tired of hearing himself gripe. Maybe the six-day battle at Hamburger Hill and Macaroni Mountain simply wore him down. Or maybe he’s hitting a growth spurt and his body is overriding his brain’s tendency to fuss. I once read in a parenting book that kids will do that. According to Penelope Leach’s “Your Baby and Child,” research at a London day care showed that year-olds who were given a variety of foods three times a day and were allowed to pick for themselves ultimately chose a balanced diet. Now, that diet might have looked wildly out of whack on a meal-by-meal basis, but it all worked out long-term. I know I’m that way. I’ll go on a bread bender before I swing back and devour a bunch of asparagus by myself. Boots will reject vegetables for days before walking to the fridge and lovingly stroking his baby carrots. It’s just that it’s harder to trust with Big Guy, who at times eats so little I wonder how a child can subsist on air and the occasional pizza. He always comes back around, though, even if it’s for only a few blissful hours. Note to self: Print this post, encase in glass marked “in case of emergency” and hang it in a prominent place in the kitchen. I’m sure I’ll need to refer to it within a week.